A new-build 26.7 metre Sanlorenzo SX88 motor yacht has been sold to a central European buyer by Sanlorenzo Spain. She is scheduled for delivery in early 2020 as the 14th hull of the revolutionary Sanlorenzo SX88 model, which was first introduced to the market at Cannes Yachting Festival in 2017. The 26.7 metre Sanlorenzo SX88 model is built in GRP with carbon fibre infusion technology and a semi-displacement hull. As the flagship model of the SX range, the SX88 is defined by a ground-breaking crossover concept which blends heritage Sanlorenzo exterior lines with a large 30 square metre aft beach club with an integrated crane system, Volvo IPS propulsion, an efficient use of interior volume and the latest nautical innovations. Her four-cabin interior layout provides spacious accommodation for up to eight guests on her lower deck divided into a master suite, a forward VIP suite and two twin cabins. The skylounge is another star feature, with a fixed forward windshield in front of the sole helm position and four-metre long side windows that can be lowered completely. A dedicated lounging area, aft of the mast, is left open to the elements. The main deck has been designed without a wheelhouse, thus allowing guests to move from the cockpit to the bow with the minimum of obstacles and only two steps. Cutaway bulwarks will help to increase the amount of light permeating this open-plan area, which comprises a saloon, galley and dining area. Triple Volvo 800hp diesel engines will allow a cruising speed of 20 knots, topping out at 23 knots. 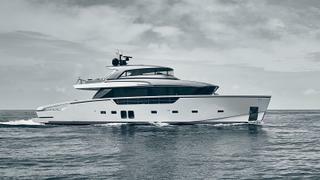 The asking price of the Sanlorenzo SX88 has been withheld.